Here at Clachaig we increasingly recognise the need to operate our business so as to minimise our impact on the environment and to operate in a sustainable manner wherever possible. Adopting such a policy has involved taking small steps towards our objectives and we’ve set out some of our achievements to date below. However, we recognise that we can still achieve more, and we keep our policies under constant review. 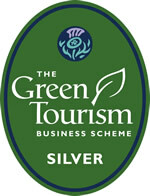 Clachaig Inn has been awarded the Green Tourism Business Silver Award. The scheme, operated in conjunction with VisitScotland, is a recognition of environmental achievement and is a useful tool in operating a sustainable business. Champion Scottish malt whisky – again, a “real” product having a distinct Scottish identity. Clachaig stocks as many as 200 varieties on the ‘top shelf’. In as far as practical, considering cost and supply issues, use locally (from within Scotland) sourced meat and fish products in our menus. Some produce, such as venison is generally supplied from the Lochaber hills. Staff induction and on going training via Key Skills documents contain reference to Environmental Impact Policy and Sustainability issues. Bottles & other suitable glass products are collected and taken away for re-cycling (for a fee) by a commercial contractor. At least once per year, collect litter along road between Clachaig and Glencoe Hostel. Reserve “bar top” fund raising for Glencoe Mountain Rescue collection boxes. Draw water from a private supply, using UV filtering and no chemical treatments.